I think there is a great story out there where Jo Grant gets to meet the wonderful Iris Wildthyme and I also think there is a great story where the modern Jo Jones gets to go back to the UNIT era. However, I don't think that either of these points should be in the same story and I certainly don't appreciate the return of Huxley, a novelist from the planet Verbatim Six. Find and Replace does all three of these points and the result is something that is a rambling but intermittently charming little story that will please fans of Jo Grant, like it pleased me. I suppose it would also please fans of Huxley, if such fans do exist. But the story lacks any form of complexity that would have made this story a real success. It's Christmas 2010 and Jo Jones is doing some last minute Christmas shopping when she meets a stranger in a lift. When the lift stops, she is fearful of the stranger when he explains himself, her fear turns into something of bafflement. He knows all about her adventures but not the ones with the Third Doctor but...Iris Wildthyme! It all turns out to be a plan from the Doctor who had implanted a cover story into her mind to protect her should any of his enemies come a-knocking. And before she knows where she is, Jo is whisked off to Iris's double-decker bus, no longer sure what the hell to believe and travelling into her own past, breaking all the laws of time in the process. But what she finds waiting for her is an even greater surprise. Written by Paul Magrs, inventor of Iris, he is hilariously inventive at his best but in his Doctor Who work, not his Iris, he takes jokes that aren't funny in the first place and makes too much of them. Huxley is the perfect example of this. I haven't heard his previous appearence in Ringpullworld, but his constant interuptions in the narrative are funny to begin with but gradually grind on one's nerves. This post-modern joke isn't funny any more and because of this, the first episode has very little too offer it. The second half picks up quite a bit, offering a lot more in the form of a plot, more than a group of people stuck in a lift takling to each other would. While I can't say too much about this episode for spoiler reasons, the material isn't anything we haven't heard before and no amount of skill is going to overcome the familiar feel of it. On top of that, the magical narrative devices that Magrs uses to weave the plot points together feel far too contrived, almost as if he looked at the characters he needed to use and tried to squeeze them into a concept they didnt quite fit into. There is even one point were a character is obviously sent away because they contribute nothing to the plot! Structure isn't something Find and Replace is good at. 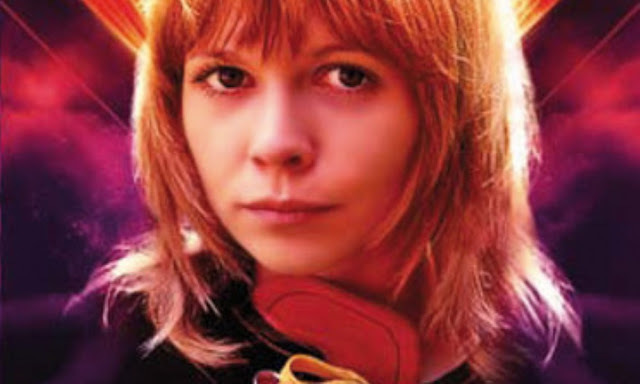 But this is a high point for actress Katy Manning who is charming as Jo Grant but sublime as Iris. As in her previous outings as Iris, she embodies the role whole-heartedly while avoiding making the character too over-the-top, something a lesser actress would probably do with a character like Iris Wildthyme. So magical is Manning that she makes you forget the one weakness of Iris, her one-note personality. Where the narrative might struggle, the scenes with the wonderful Iris Wildthyme succeed brilliantly.